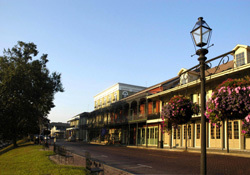 The Natchitoches Historic District reflects two stages of the city’s history. The lower section of the district on the west bank of the river encompasses the early French colonial section of town. Though no buildings remain from the time of the founding, many of the modern roads follow the earlier routes of the first roads in Natchitoches, explaining the non-linear layout in this part of the district. The northern area of the district contains the Natchitoches downtown area and represents a later stage of the city’s history. The downtown area was originally settled in the 1780s, during the period the city was under Spanish control. In 1788, a new Catholic church was completed at the corner of Front and Church streets. The city grew around the new church, and the area quickly became the heart of Natchitoches. The downtown area has served as the government and economic center of the city since that time. Geographically, the historic district comprises a large area of the town along the West bank of the Cane River, and a narrow strip of land on the opposite shore. Buildings in the district are constructed in several different architectural styles, including Queen Anne, Italianate, Spanish Revival, Federal, Art Deco and Victorian. Most notably, the district also contains several examples of French Creole architecture. The Natchitoches Historic District boasts the only known two-story building entirely constructed of bousillage (a mixture of mud, Spanish moss and deer hair), the Prudhomme-Rouquier House. The only three examples of authentic French Creole townhouses outside of New Orleans are also located in the district: the Ducournau Building, the Blanchard Building and the Prudhomme Building. Within the district is a smaller, 33 city-block area that has the additional designation as a National Historic Landmark. The Natchitoches Historic District is roughly bounded by 2nd and 4th on the west, Pavie St. on the north, Williams Ave. and Jefferson St. to the east and College Ave. to the south. For further information, visit the Natchitoches Convention and Visitor's Bureau website, call 800-259-1714 or stop at their visitor center at 781 Front St. for a walking tour map. Front Street has also been documented by the Historic American Buildings Survey.